Another day, another bride gone wild. The latest to join the bridezilla gang is the young bride to be who sent out the craziest dress code to not only her bridesmaids but her entire guestlist. Now, a dress code or theme isn't the strangest thing to happen to a wedding. Except when there are specific instructions for each of her guests based on their weight. And no you did not misread that. 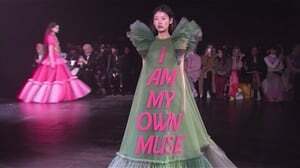 Each guest was given a specific dress code based on how much they weigh. 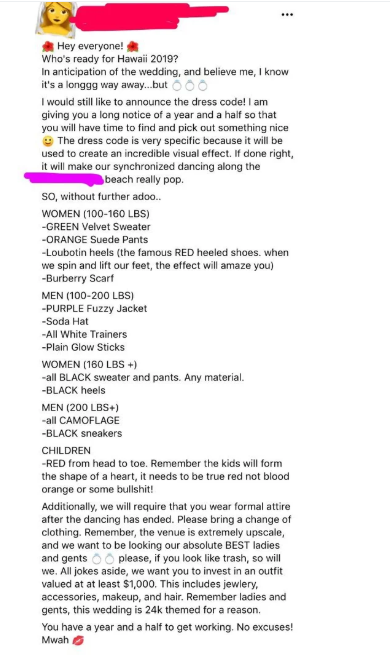 In a screenshot of one example that was sent to her wedding guests posted on Reddit, the bride to be explains that the dress code is specific because "it will be used to create an incredible visual effect". She also mentions that it will make the synchronised dance, which will supposedly happen on the day of the wedding "pop". Here is a screenshot of the dress code that left her guests simply shook, and for very obvious reasons. So women between 100-160 pounds (45-72 kgs) should be dressed in a green velvet sweater, orange pants and red bottom Christian Louboutin heels plus a Burberry scarf, while women over 160 pounds (72kg) should be dressed in all black tracksuits and heels. Men between 100-200 pounds (45-90 kgs) need to wear purple fur jackets, all white sneakers and they need to have plain glowsticks, while men over 200 pounds (90 kgs) are expected to wear camouflage and black sneakers. The kids (yes, she involved the kids) are meant to wear all red to "form the shape of a heart". Luckily there's no weight discrimination there. 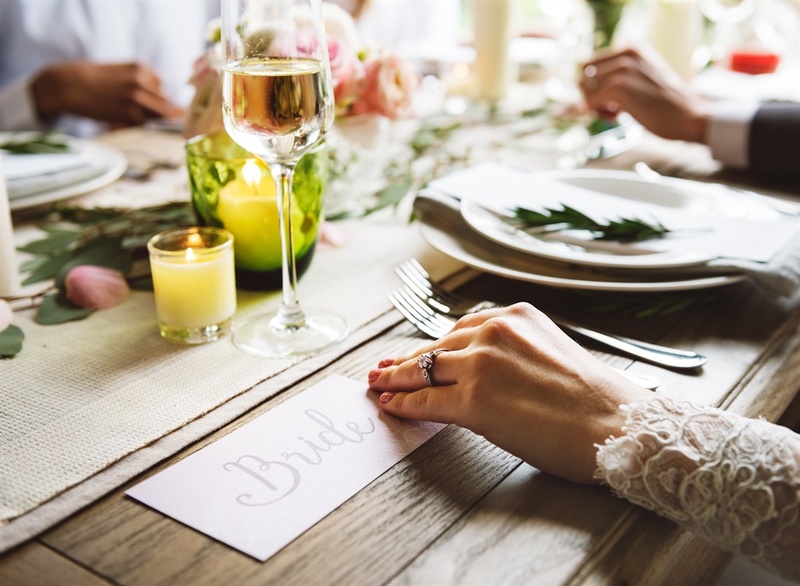 The crazy continues as the bride then requests the guests to wear an outfit worth at least $1 000 (R 14 093) once the dance is over because "the venue is extremely upscale". "Please, if you look like trash we all do, all jokes aside, we request that you invest in an out valued at at least $1 000" she writes at the end of the list. And no, the story does not end there. After the bride to be discovered that her dress code had been leaked, things became even crazier. In a rant text the wedding guests were then invited to a "Polygraph Party" to find out who leaked the dress code. According to this article on iHeartRadio, the bridezilla says she "could not be more crushed, betrayed, or saddened," and then goes on to invite everyone to the polygraph party where she "will be hunting out the snitch who put me on blast." She also mentions that she bought a polygraph for $99 (R1 400) on Amazon and unless guests have a valid excuse of why they can't attend the polygraph party, they will be "presumed guilty." She then ends off her rant by explaining that she was a spiritual healer and all the crazy additions to her dress code were as a result of her beliefs. Just when we thought we'd seen it all with the bridezillas. Have you ever attended a wedding with any crazy requests? Chat to us here.